With 78 protected areas covering more than 8,500 square miles, Nicaragua dedicates 17 percent of its landmass to ensure its flora and fauna thrive, allowing a wide array of creatures to flourish. With habitats ranging from rainforests to lakes and mountains to volcanoes, discover the species you could see during a trip to the country. Here, our top five. Inhabiting the tropical forests of Central and South America, the two- and three-toed sloth go by largely unnoticed in Nicaragua, as it takes a special eye to spot the creatures in the treetops, where they can often be seen hanging upside down. Thriving in rainforests where temperatures are stable and consistent, the sloths find sanctuary within the constantly delightful weather of Nicaragua. Three-toed sloths have tan coats, while two-toed sloths usually have gray-brown fur, which offer the creatures a layer of camouflage within the jungle canopy. If you do discover a sloth, you will be able to view it intricately, as it takes the species nearly six hours to travel just one mile. As the largest cat in the country (and the largest in the Americas), the jaguar is the king of the Nicaraguan jungle. Its yellow and black spots are easy to spot, but the cat is often elusive and is usually only seen in protected areas. Once roaming everywhere from Argentina to Arizona, it’s estimated only 15,000 jaguars still live in the wild. Weighing up to 200 pounds, jaguars tend to populate the Atlantic Coast of Nicaragua; you can likely spot the cat in in locales like Indio Maíz Biological Reserve and Bosawás Biosphere Reserve. You can find Nicaragua’s cutest monkey swinging from the treetops; the white-headed capuchin is native to the forests of Nicaragua, and as a spreader of seeds, the species plays a vital role in the ecology of the country’s rainforest. If you see one capuchin, you probably are amid up to 20 of the species, as the capuchin tends to travel in packs. Once you find a group, observe their unique habits. The monkey is noted for its intelligence – they utilize tools to clean their bodies and to aid their ability to gather food. Much smaller than the famed jaguar, ocelots are even more difficult to observe in the wild of Nicaragua, as this species is most active during twilight. Ocelots have short and smooth fur, typically denoted by a cream, tan, and black coat, and the animal’s round ears are usually marked with a bright patch of white. As solitary and nocturnal animals, ocelots usually rest during the day. When you’re walking in the forest, don’t forget to look up! Ocelots can often be spotted resting on tree branches or beneath the base of fallen trees. Quite possibly the most delightful creature to spot in Nicaragua, the sea turtle thrives in abundance in the country. Four species call the country’s beaches home; Mukul is home to the endangered Olive Ridley Sea Turtles and Leatherback Sea. 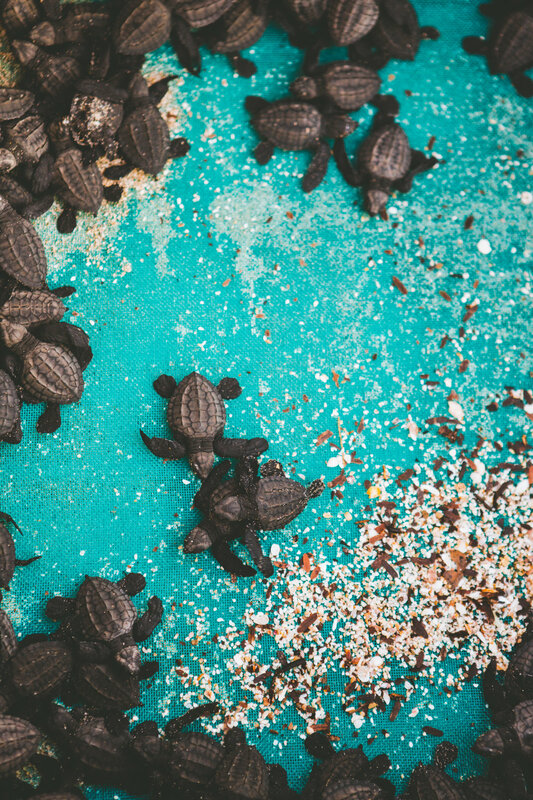 To protect them, Mukul launched the Sea Turtle Conservation Program as to provide a protected area for the creatures to lay their eggs. 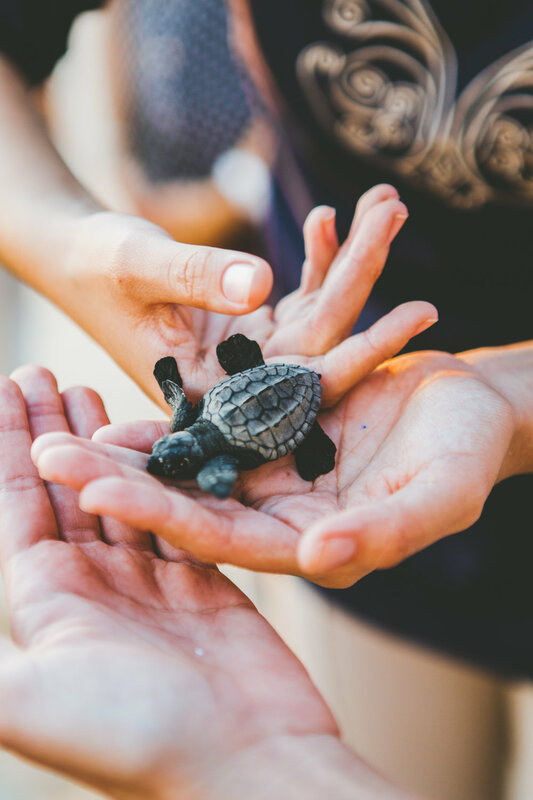 During your visit, help re-populate the regions' turtles when you participate in Mukul’s on-site baby turtle release program.